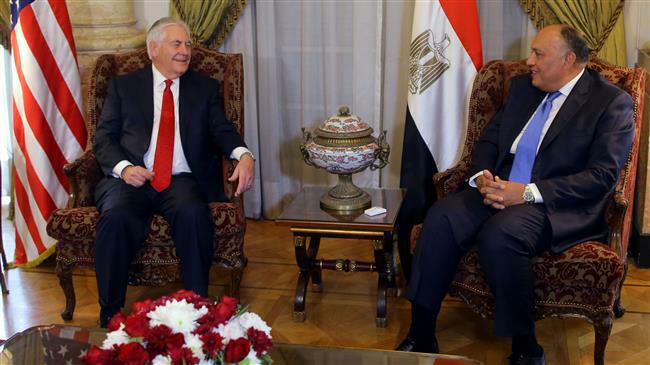 Cairo(ANN)-Secretary of State Rex Tillerson has arrived in Cairo, Egypt, beginning a trip through the Middle East as he faces confrontational talks at almost every stop on his five-country tour. Tillerson started his trip on Sunday, but a key US ally , Israel, is conspicuously absent from his itinerary. When the trip was first announced this week, with stops in Egypt, Jordan, Turkey, Lebanon and Kuwait, Israeli politicians rebuked Tillerson for skipping Israel. “The consistent absence of the Secretary of State [from] Israel is probably unprecedented,” former US ambassador to Israel Dan Shapiro tweeted. On Saturday, US President Donald Trump said Israel’s settlements in occupied Palestinian territories have “complicated” the so-called peace process and urged “care” over the issue. Tensions escalated in the region after Tillerson’s trip was confirmed, as Syrian anti-aircraft shot down an advanced US-made Israeli warplane on Saturday. It was Syria’s first serious air defense operation to confront Israeli violations of its airspace. Israel claimed that it had earlier intercepted an “Iranian” drone, and that the warplanes had been dispatched to hit the site where the drone had been launched from, only to face Syrian anti-aircraft fire. Trump administration policies will be at the center of Tillerson’s talks in Amman, Jordan’s capital. With a large Palestinian population, Jordan is unhappy with Trump’s decision to recognize Jerusalem as Israel’s capital and move the US embassy there. But the most contentious stop this week is likely to be in Turkey, where anti-Americani sentiment is rising, with some officials in Ankara calling the United States an enemy of Turkey.